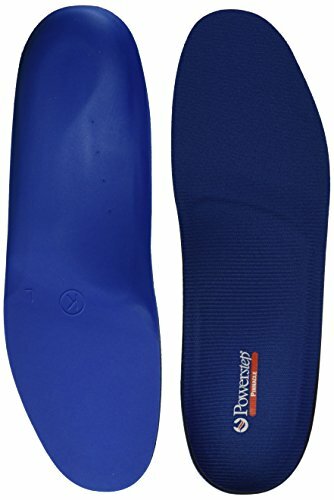 The Powerstep Pinnacle orthotic and shoe insole is the most popular Powerstep orthotic due to its versatility and ability to help alleviate many common foot conditions such as plantar fasciitis, mild to moderate pronation, metatarsal pain, heel and arch discomfort, flat feet, sore and tired feet, and much more. It supports all arch types – low, neutral and high arches, and fits into a variety of shoe types with removable insoles, including athletic, casual, dress and work shoes or boots. The Pinnacle offers the perfect blend of foot control, spring and cushioning for outstanding comfort. The dual-layer cushioning of a durable EVA foam base plus a plush top layer, paired with the Powerstep Variable Cushioning Technology, enhances the comfort in your shoes. Firm yet flexible built-in arch support and a deep heel cradle help to stabilize the foot in casual, athletic and work shoes. For mild to moderate pronators, the Pinnacle provides total contact support and a softer feel for your foot. The Pinnacle helps relieve foot pain due to plantar fasciitis, metatarsal issues and more. The Powerstep Pinnacle orthotic also features heat and friction reducing fabric, which helps feet stay cool, dry, and odor-free during strenuous activity – keeping your feet comfortable, healthier, and blister-free. Powerstep has been providing the highest-quality in orthotic shoe insoles since 1992, when our founder, a podiatrist, foot surgeon and runner, saw the need for a ready-to-wear orthotic that would be more convenient and more affordable than custom-made orthotics. Our products are found in retail stores throughout the country and are the leading brand of orthotic shoe insoles prescribed by a range of medical professionals. At Powerstep, we’re committed to continuing to produce the best in orthotic shoe insoles to help reduce foot pain. Strong, Medical-Grade Foot Support: Encapsulated design and semi-rigid shell give you flexibility and full arch support for mild to moderate pronation. Deep Heel Cradle: The Pinnacle's deep heel cradle protects your heel during the heavy impact of landing during walking or running and stabilizes the foot. Double Layer Foam Cushioning: Many shoes do not have the proper amount of cushioning for your feet. The Pinnacle gives you maximum cushioning and enhanced comfort. An ideal orthotic for preventing and alleviating pain associated with plantar fasciitis and other common foot conditions.Arch support insoles increase stability and comfort in casual, athletic and work shoes.